One of Lama Zopa Rinpoche’s Vast Visions for FPMT is for some FPMT centers to display huge thangkas and host festival days. The beautiful appliquéd thangka of Guru Rinpoche. The thangka will be displayed during 1,000 Padmasambhava tsog offerings in India and Nepal and during special occasions. 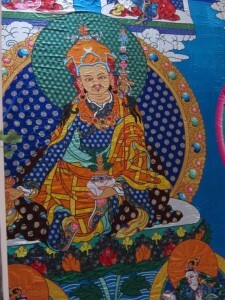 A close up of Guru Rinpoche as depicted in this large thangka. 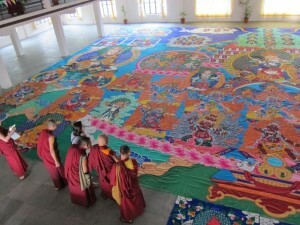 In 2011 Lama Zopa Rinpoche through the Lama Zopa Rinpoche Bodhichitta Fund commissioned a 55 ft x 40 ft high stitched appliquéd thangka of Guru Rinpoche (Padmasambhava). 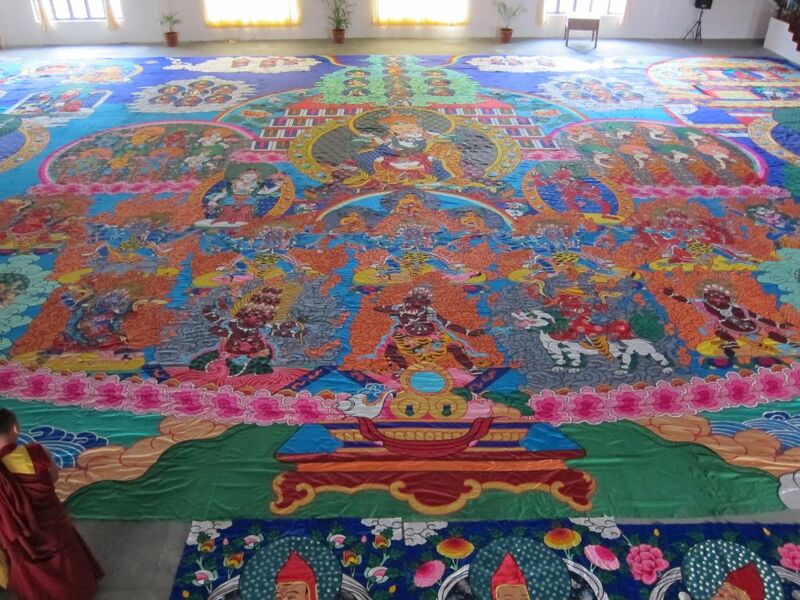 The thangka will be displayed during 1,000 Padmasambhava tsog offerings in India and Nepal and during special occasions.The total cost of the thangka was US$75,000 and was fully sponsored by an incredibly kind benefactor. In the middle of the thangka is the Padmasambhava merit field. The right side has eight aspects of Padmasambhava and the left side displays Padmasambhava’s pure land. 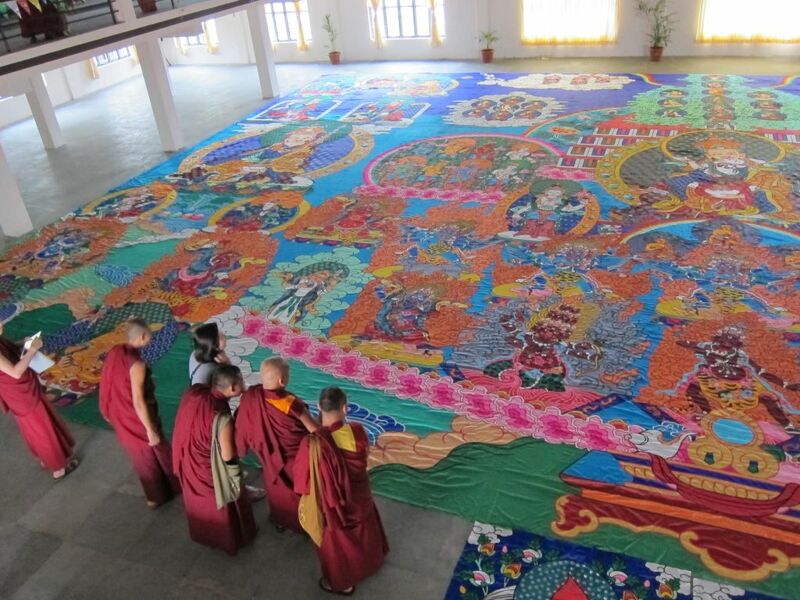 In 2012 Rinpoche went to see the progress of the thangka which was quite incredible. It was blessed by His Holiness the Dalai Lama during the Jangchup Lamrim 2013 teachings. “I would like for there to be many thousands of offerings in front of the thangkas as well as offering banners. People could sit facing the thangka, or sit like they would in a puja. Extensive offerings can be set up and practices such as offering bath, prostrations, extensive offering practice etc. Students can recite the Seven Limb Prayer and offer a puja. 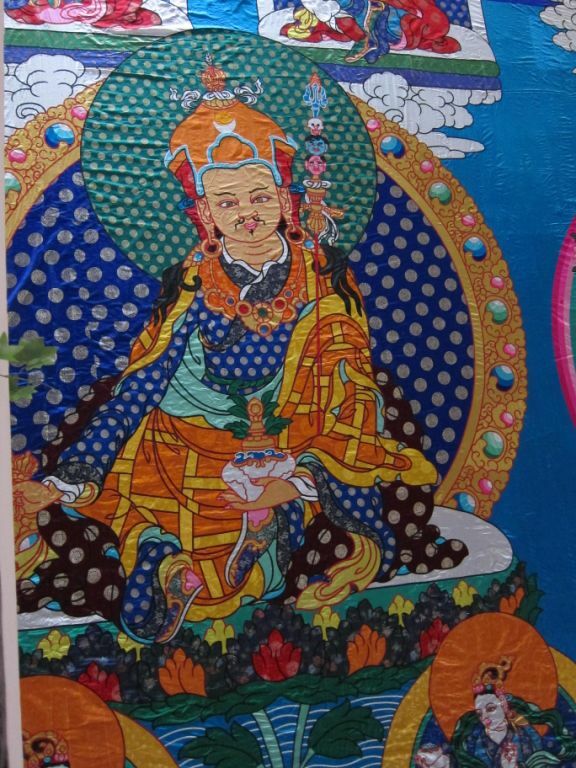 The beautiful appliquéd thangka of Guru Rinpoche. “During the festival day in the beginning the centers could give some introduction to Buddhism, then also to lead a deity puja (according to what thangka is being displayed). Then people can offer music, dances, etc., to the thangka (and also for everyone to enjoy). In this way many people make a connection to the deity and connect to Dharma. Also many people who would not normally come to the centers will come: people with children, the elderly, neighbors. “The idea is for many people to offer music to the Buddha, offer dancing, offer singing, etc. The main thing is making the offering to Buddha. By offering to Buddha then it is something so meaningful, instead of just entertainment. “The centers can have a large umbrella above the thangka (yellow or orange color cloth). Also can have a procession up to the place where the thangka is displayed. “The center could advertise the festival day widely and invite people outside the center. “My wish is for the big centers in FPMT to have these large thangkas. This is a way to leave imprints for all these people [who see them], for enlightenment. “The festival days can be within the first day or Losar or the 15th day of Losar (Day of Miracles). On that day the merit is multiplied, so therefore every offering and practice you do, any virtue you do, increases one hundred million times. So if the festival is done on one of those days. “Other ideas: people can do three circumambulations around the thangka, centers could organize to have a horse carriage so that children can go around the thangka in a horse carriage. Then the horse also collects merit. Any animal that comes on that day makes their life meaningful. Children can go around on the horse carriage and all the people that can’t walk, they can still go around too. “This tradition comes from Tibet, where they would display a very, very large thangka on a mountainside, or on the wall once a year.